Last semester, I wrote a post on this blog about how to bring archives into the classroom as a way to enhance curricula. Last week, I put my ideas into practice. In preparation for Deborah and Shelby’s fourth grade farm trip, I was invited to share stories of past farm trips with the class. I began by reading a description of the farm trip from Agnes DeLima’s 1942 book The Little Red School House and asked the students what they thought the author was describing. Many guessed correctly right away, but many were also surprised to hear that the book was written so long ago! A student looks at the song written on a farm trip long ago. I explained that the very first farm trip was in 1925 and therefore this year’s farm trip would be the school’s 92nd. The students were very impressed by that number and were even more impressed when I told them that the farm trip used to take place during the entire month of June. Many thought this was “not fair,” that they wished they could go to the farm for a month. 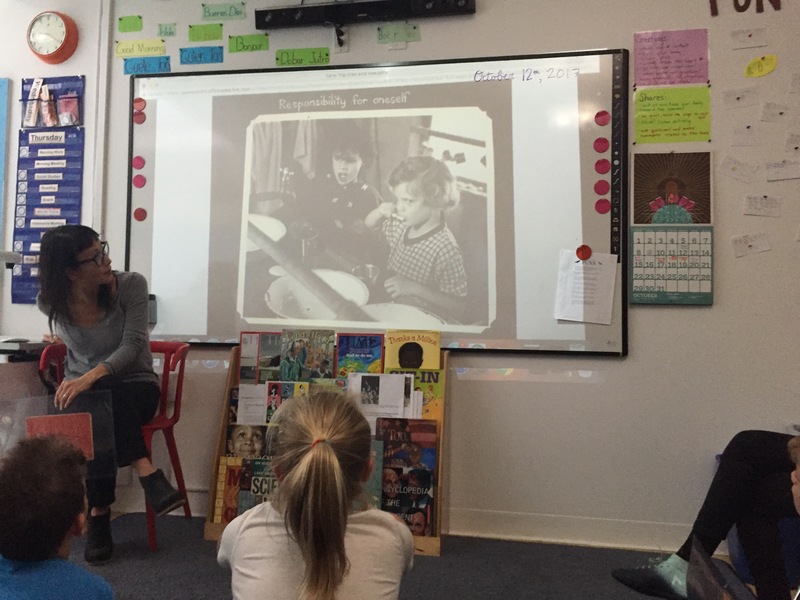 I then presented a slideshow of photographs from farm trips in the 1940s and 1950s showing past students in their bunks, doing chores, and having fun. 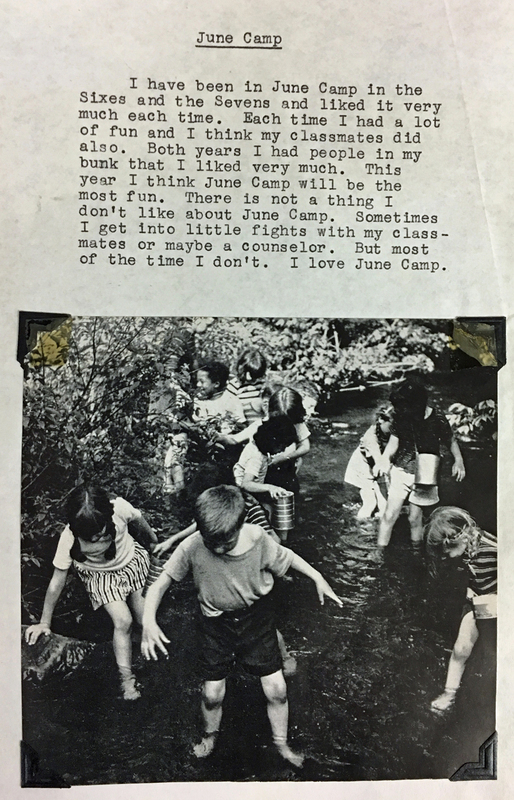 I then asked for a volunteer to read a short “essay” written by a student in the 1950’s about why he loves “June camp,” as it was called when the students went away for the entire month of June (see essay in slideshow above). The archival photos were followed by a series of photos from last year’s farm trip. The images depicted current students also in their bunks, doing chores, and having fun. The students were thrilled to to see themselves and their friends up on the screen and shared memories of their experiences last year. different from your farm trip last year? similar to your farm trip last year? The students came up with many differences: the trip used to last a month and now it’s a week, the trip used to be in June and now it’s in October, the students used to go swimming and now they don’t (or can’t). There were many similarities as well: the students all had to clean up and do chores, they all had bunks (though now they have bunkbeds! ), they all brushed their teeth, they all explored nature, and, most importantly, they all had fun. I finished the session with a final slide, a photo of Elisabeth Irwin and students on a farm trip in the late 1920’s and a group photo from last year’s trip shown side by side. I hope that this final slide reinforced the idea that LREI students are part of a long tradition here at LREI, that they are part of its history, and that even if they are a little nervous or scared about going away for four days, that they will undoubtedly learn many things and have a wonderful time! On February 7, LREI held an alumni archives night at the high school. Alumni from the 1950’s, 60’s, 70’s, 80’s, and 90’s were in attendance, and a fun evening of wine, pizza, and photographs was had by all. A million thanks to everyone who came and pitched in! Without the help of alumni (as well as current students, faculty, and staff) the archives will never be complete. No matter how well I organize and categorize the thousands of photographs in the LREI archives, I will never be able to perform the most crucial task of identifying and describing the contents of the images. This is entirely up to the LREI community and their iron-clad memories. This task is what makes an archive come alive, adding incalculable value to its contents. These photographs reflect LREI’s rich history, but only through identification and context can they truly tell our school’s story. If you are an LREI alumni and would like to attend the next Archives Night, please contact Elisabeth Ingwersen Mendez at eingwersenmendez@lrei.org. I was flipping through the latest issue of Archival Outlook (yes, there actually is such a magazine! 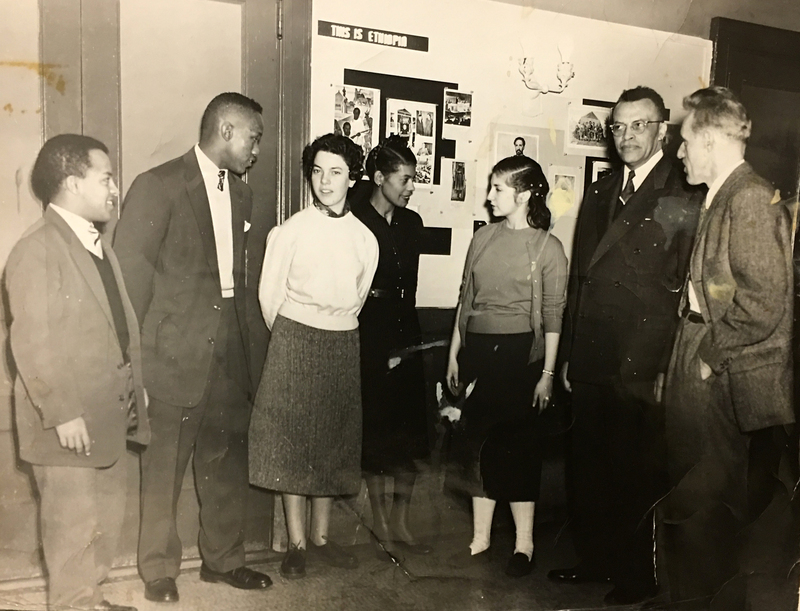 ), and I came across an article entitled “Teachers in the Archives” about hosting a professional development day for K-12 teachers (read the article HERE). 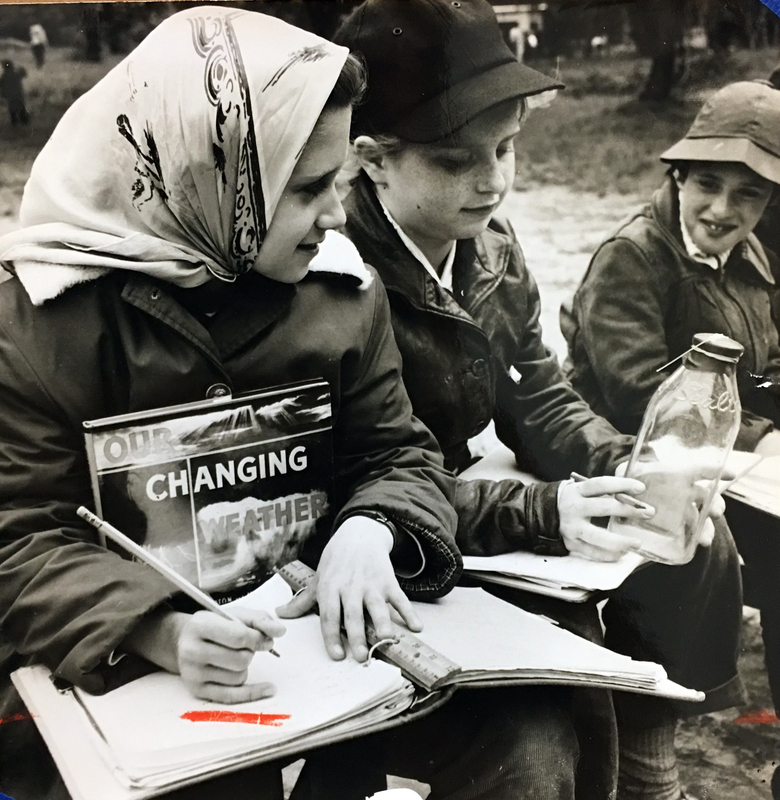 With the rise in popularity of inquiry-based learning, there has been much activity in the world of archives lately to encourage teachers to teach effectively with primary sources, even in the lower grades. 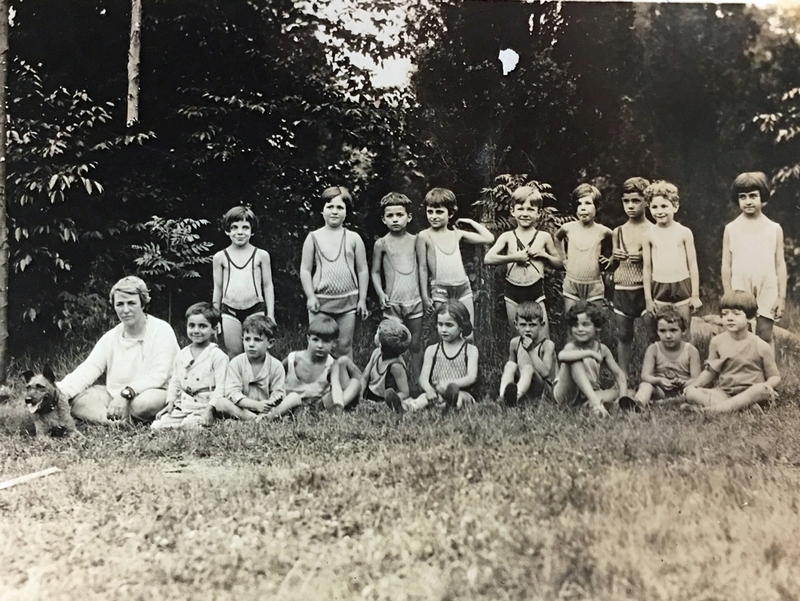 This is a photograph at Camp Aladin of Elisabeth Irwin, Barney Whiskers, and Little Red School House students at June Camp in 1929. Can you believe that the entire school used to spend the entire month of June upstate? This is a photograph and brief essay by a student reflecting on his (positive) experience at June camp. The children are wading in a river and having fun! 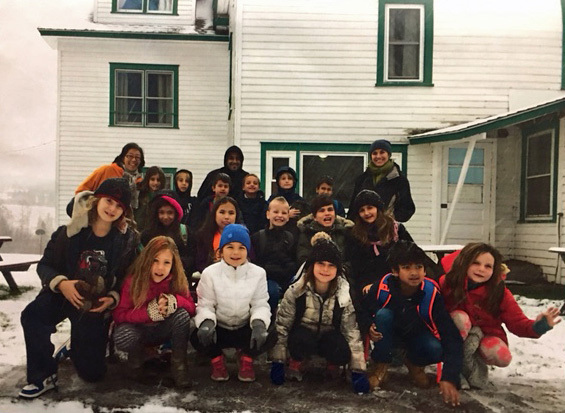 That farm trips have been a tradition in their school since Elisabeth Irwin’s time, which was long ago. (The students are currently learning the concept of long ago). The students from long ago look and sound like they had a great time on their farm trip. The students from back then are not unlike the students of today. These images give the students “proof” that they are part of a long tradition and do not have to rely on hearsay. Teaching with archival materials also opens up a new method of research, showing students that they can learn about history through avenues other than books and web searches. What could students learn by looking at this photograph? 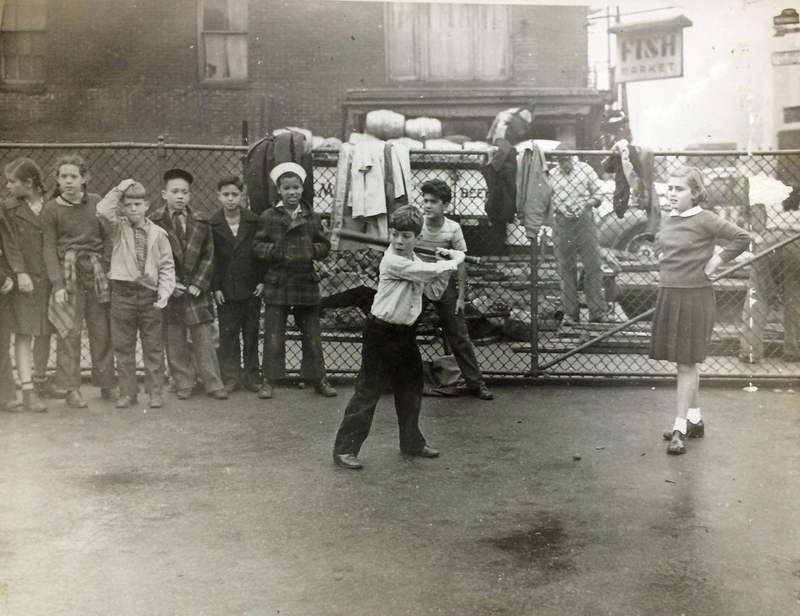 The LREI Archives Project is in full swing! I have been coming in on Monday mornings to begin processing our paper files and the Alumni Archives Committee has been getting together at the high school to go through our enormous collection of photographs that goes back to the beginning. They have been tirelessly sorting images and identifying students. We are lucky to have alumni with such solid memories of their classmates! Just the other day, I came across an interesting photograph. 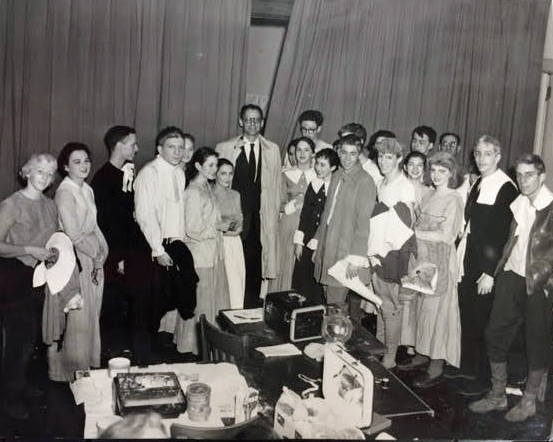 In this 1957 photo, Arthur Miller stands with the LREI cast of The Crucible after a performance. 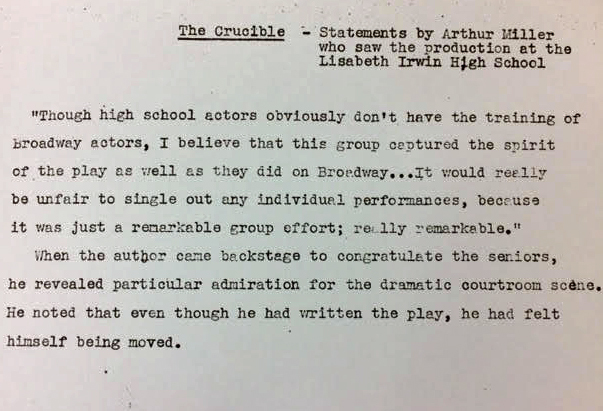 I also found this note that quotes a statement Miller made about the production. Miller’s son, Robert Miller, was a student at EI and later went on to be a film producer who brought his father’s iconic play to the big screen in 1996 with his father as screenwriter. This is but one of countless treasures I’ve unearthed in the LREI Archives. I will continue to share interesting finds from time to time to illustrate the depth and richness of LREI’s history, so please stay tuned! On February 26, I had the pleasure and honor of attending a meeting of archivists from NYC independent schools at the Collegiate School. Also present were archivists from Trinity, Nightingale, St. Bernard’s, Spence, among others and representatives from the Winthrop Group and Gartenberg Media Enterprises, two companies who work closely with school archives in New York. The meeting covered topics such as collections policies, management programs, disaster recovery programs, digitization, and storage. I remained silent during the meeting, as we at LREI have not yet set up these systems. I listened intently and learned much from the recommendations of experienced archivists. Looking back at the meeting, the thing that strikes me most is how much each school represented treasures its archive. Everyone agreed that whatever resources had been put into setting up and maintaining their archives, they had recovered their “investment,” whether financial or in kind, exponentially. Many of them, like ours, were assembled in advance of a centennial celebration, and have since gone on to be valuable resources for fundraising, alumni relations, and recruitment of new students. 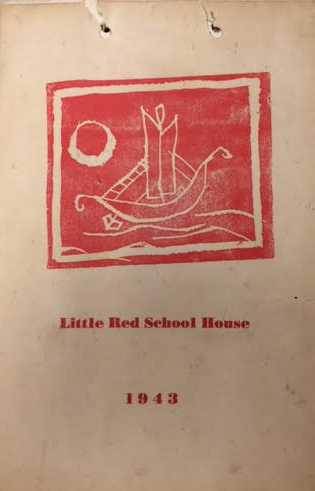 I feel that the LREI archives will also serve all of these functions, but that perhaps its most important function will be to preserve the legacy of Elisabeth Irwin and her creation of a most extraordinary, ground-breaking, and singular school whose legacy has gone on to influence not only New York City schools, but the field of education as a whole. 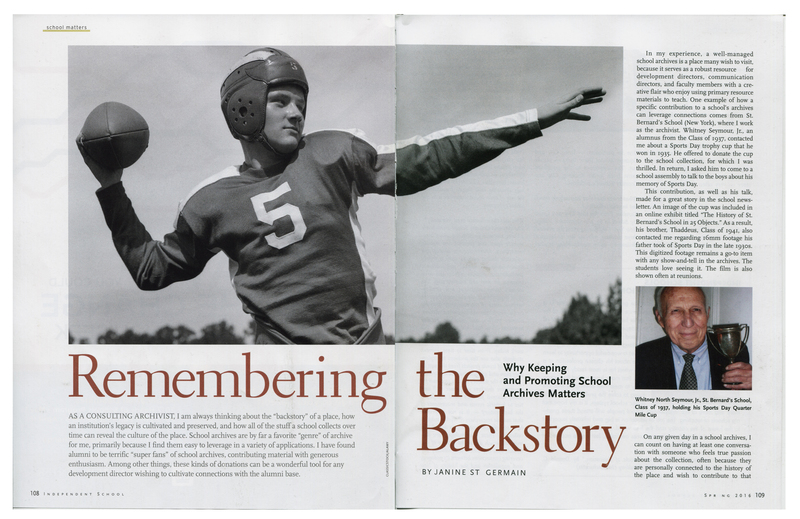 To read more about the importance of archives in school, read my fellow archivist’s article “Remembering the Backstory: Why Keeping and Promoting School Archives Matters” in Independent School magazine’s 75th anniversary issue. Last fall, I was approached by L.J. Mitchell and Ryann Imperioli in the LREI Office of Advancement to possibly work with them to create an institutional archive in advance of LREI’s centennial celebration in 2021. I am an LREI parent who also happens to be an archivist, and I was delighted with the idea. LREI has saved important archival material since its founding, but it has not yet been catalogued as a comprehensive collection, and I, as well as everyone else, thought that an institution as important to New York and educational history should have a proper archive that can be made accessible to staff, alumni, current and future families, and researchers. 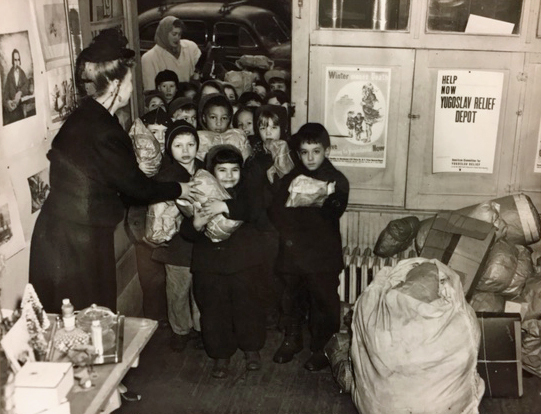 An archive will not only be a record of LREI’s rich history, but can also serve as a development tool as well as an educational tool for students. 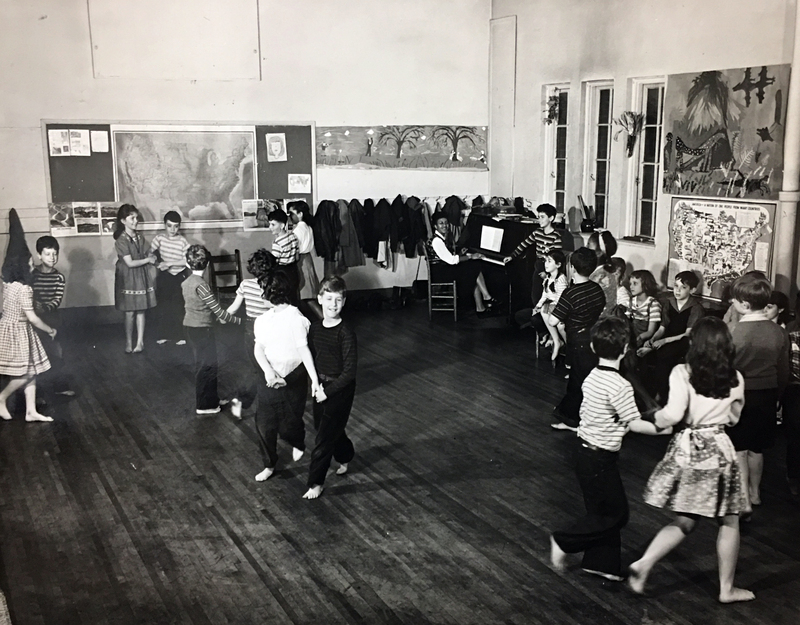 Online exhibitions of items from the archives could bring together alumni scattered across the world, thus kindling school spirit and nostalgia, which would in turn widen the growing LREI community. Students can learn to use archival materials as research tools before going off to university, where they will be asked to perform rigorous research with primary source materials. Historians of New York, education, and social movements would be able to access the materials and add LREI to their research. 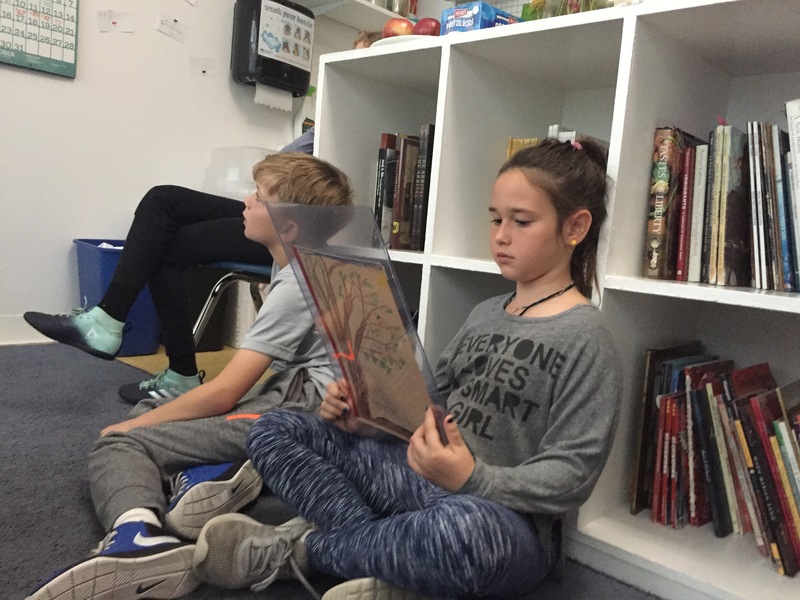 There are myriad ways that an archive can represent the school to diverse audiences and spread the word about a place where progressive education thrives. One year into my involvement with the archives, we have made much progress to lay the foundations of a solid archives program. This post is a recap of what has been accomplished thus far and what I think we should do moving forward toward the centennial in 2021. 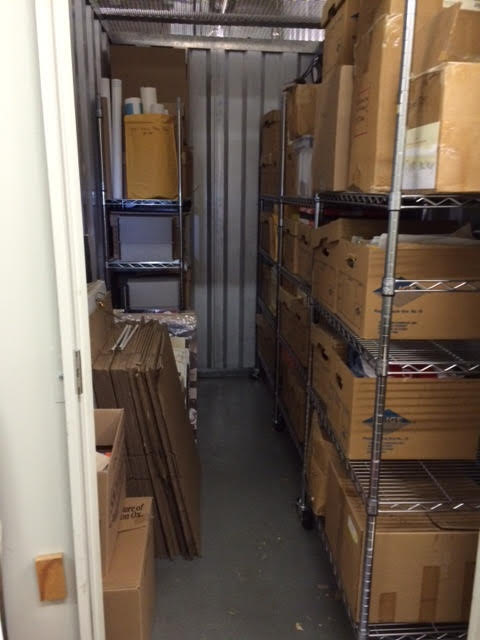 Since it was last processed in 1996, the LREI Archives have been slowly dismantled due to lack of stewardship. Items were removed by staff for reunions, publications, etc. and were not returned or properly protected, which has resulted in damage to valuable archival items. Items were also placed in piles in no particular order, making these items irretrievable for future use. Martha Foley, our current archival consultant and the archivist who arranged part of LREI’s archive back in 1996 through a grant from the New York State Documentary Heritage Program, has assessed the current state of our archives and submitted a report of her findings. I have attached a summary of the report that reviews her eight recommendations for next steps. 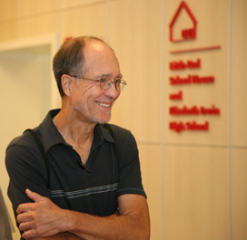 On October 8, I had coffee with Nick O’Han, former high school teacher and school historian. Nick returned to the Office of Advancement two boxes from LREI’s treasure trove of clippings and photos related to Elisabeth Irwin and the founding of our school, documents that he knows by heart because he is in the process of writing the definitive history of LREI that includes an in-depth study of Irwin and her circle. There may be files still missing from this record group, as some of Nick’s files are in storage. He has assured me that he will look through his off-site files to see if there are any belonging to the LREI Archives. In addition, I am pleased that he has agreed to write the historical note for our collection once it has been processed. Last spring, Violeta Picayo, LREI Alumni Associate, and I went on a treasure hunt to track down two copies of every issue of Expression from 1945 (the first year it was published) until the present to keep in our archive, one working copy and one archive copy. We did surprisingly well, I must say. We found every issue except 1945, 1949, and 1965. Over the summer, LREI contracted with Hudson Archival to digitize our yearbooks so that we can put them online. We just received the digital files this past week. 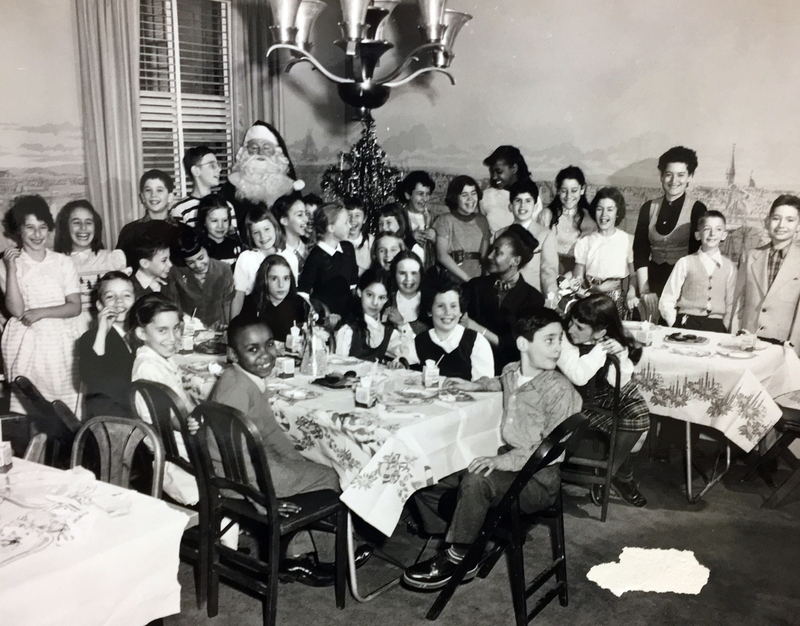 We hope to make the images searchable so that alumni can tag images to help us identify people in photos, as well as get back in touch with the LREI community. Last January I paid a visit to Jordis Rosenberg, School Archivist of the City & Country Archives. Like LREI, C&C began processing their archives in advance of their centennial in 2014. I thought we could learn a lot from C&C’s experience and that Jordis would be a great contact for us. The C&C archives room is a small, climate controlled room in the basement dedicated to their archives. The room is lined with shelving that holds documents, photos, and artwork by students. Jordis, who was not the archivist at the archives’ inception, explained to me that almost all of their archival materials were processed by school librarians and parent volunteers and that they used few outside vendors. They did, however, hire someone to consult with them about designing the grand plan of the project before they began. From the very beginning, I have been blogging about every step of our archiving process. 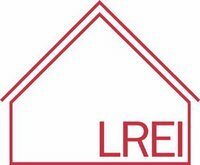 This blog is accessible through the LREI website and provides news of our. I will continue to write this blog until the archive is fully processed and ready to be accessed by the LREI community. During the coming year, I hope that we will make steady progress toward the goals outlined in the Archival Needs Assessment Report. The report recommends first and foremost that we designate a climate controlled room to exclusively house the LREI archives. There is no such room available at this time, but this committee should work toward this end in the coming years. In the interim, the most important and valuable documents, including the Elisabeth Irwin Papers, should be housed in a designated cabinet in the Advancement Office. Staff will monitor use of these documents to ensure that all items are returned and refiled properly. I volunteer to begin processing these documents using the inventory taken in 1996 to determine what, if anything, is missing from the Elisabeth Irwin Papers. In addition, I suggest that we prioritize our photograph collection for processing. The closet in the Archives Room at the High School could be used to house photographs from LREI’s collection for the time being. All photographs, aside from the most fragile images and including all photographs being stored off site, should be moved to this closet for processing by volunteers. If possible, a lock should be placed on the closet door to prevent use of the closet for other purposes and to ensure that the order of processed photographs is not disturbed. Now that we have received the digitized yearbooks, we will need to find someone who can handle the files and make them available online. Ideally, this would be someone on staff or a parent or alumni volunteer. An outside vendor could also be considered depending on budget. Last but not least, we need volunteers to help with processing. L.J. and I have discussed the possibility of affiliating somehow with the PA. This would get the word out and would facilitate outreach. Another possibility is to get interns from nearby library science schools to work for credit. These options should be discussed at the next Archives Committee meeting. After taking the summer off, the LREI archives team is back in action! Martha Foley, our consulting archivist, has been coming in over the past few weeks to look through our files and photos. 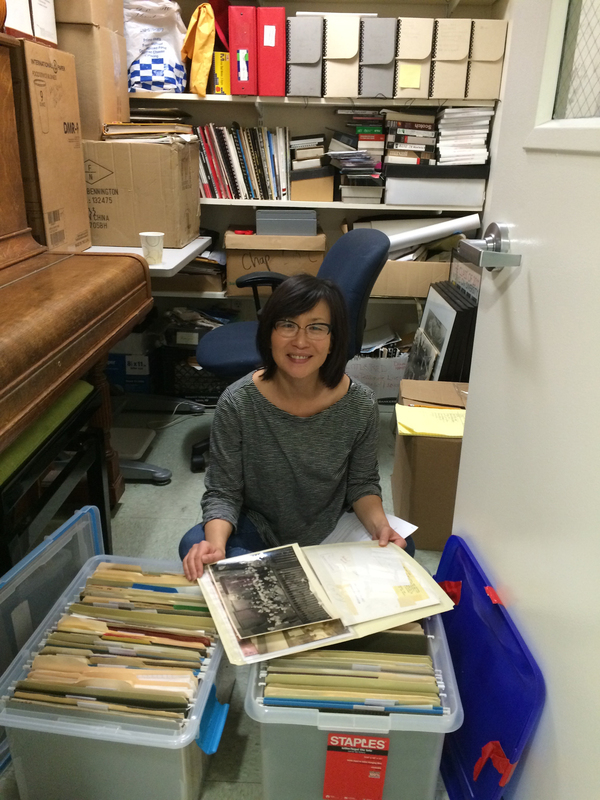 She has worked with the LREI archives in the past, so she is very familiar with our history and our collection. Martha is currently in the process of writing up an overview of the collection that will include recommendations for next steps and plans for arranging and cataloging. Also, last Thursday, I had a visit from Nick O’Han, former high school teacher and school historian. Nick and I discussed LREI’s treasure trove of clippings and photos related to Elisabeth Irwin and the founding of our school, documents that he knows by heart because he is in the process of writing the definitive history of LREI that includes an in-depth study of Irwin and her circle. I am so pleased that he has agreed to write the historical note for our collection once it has been processed. And lastly, I’ve been over at our offsite storage space tidying up and organizing our boxes and boxes of photos, VHS tapes, banners, T-shirts, posters, brochures, and yearbooks into groups so that they will be ready for volunteers to sort through. We have thousands of photographs dating from recent years to way back that need to be identified and protected. We’re off to a great start this year. I’m looking forward to working with the LREI community to build an institutional archive that documents a century of progressive education. If you are interested in volunteering to work with our archives team, please contact L.J. Mitchell at ljmitchell@lrei.org.